What do you think when you see this picture? A. Someone's getting the naughty chair. B. Cool green camera. Too bad it is dead forever. How would you feel if you had your camera near the pool and a cup of water came splashing at your face? 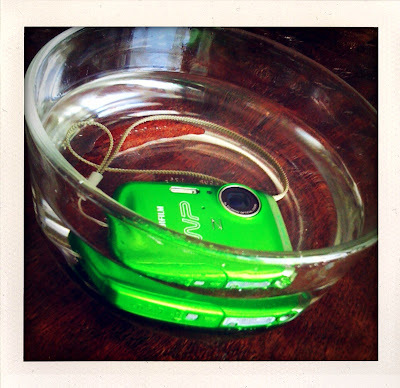 After seeing Ashley's amazing pool pictures, I began obsessing about getting a waterproof point and shoot. We spend the entire summer in the water. Be it the pool, the lake, the beach, the splash park, or the sprinklers. I have been out of the action on too many occasions because I wanted to take pictures. Plus, I have freaked out way too many times when splashing water came my way. Today I was in the pool. Mind you, it is quite unsettling to knowingly, purposely, walk into water with a real camera. I fully expected it to fail. But it didn't. It worked brilliantly. I am in love. I can be with them. I can splash. I can be splashed. I'm not yelling. I'm not panicked. It is going to be a fun, watery, summer. Go get in the water. It is so much more fun than watching from the edge. Wow! That looks like it will be so much fun! I hope you have a great time with it! I so want one of those now!!! Okay, that camera totally rocks! And it looks neat! I need one of those! Your pictures turned out amazing! Thanks so much for posting about this great gadget...And the fact that it comes in that gorgeous green color makes it even better! ohhhhhh i love the last photo with the yellow swim shirt. so awesome! now i want to be in a pool, too. i want one for sure. i checked them out after ashley's post too, but didn't know which kind to go for and some were hundreds of dollars so i quit looking. i'm all over checking out that cutie though. p.s. we just watched that baby einsteins today. it is my fave! Love them! What a great SMALL underwater camera. I am going to be recommending that one! Hahaha I have a waterproof camera and honestly, the BEST part is watching other people's reactions as you slip it under the water! I was babysitting a kid at a water park and EVERY one was stopping me and going "WHAT ARE YOU DOING?!?!" Such a wonderful idea that I would have never thought of!!! Thank you. My kiddies would love this. I saw one of those the other day and was wondering what the pics would look like. They are great! Now that is fun stuff!! I love it. I am always stressing too and also not taking as much water activity pictures as I would like. I love this idea! To me summer is all about water too. Love it. I want one too! I've seen some AMAZING shots from people who had these in Hawaii while snorkeling. How cool is that!? I am so getting one of these; thanks for the reminder about how cool they are! That is so stinkin' AWESOME!! And how cute is that camera itself?! I Love green, and would probably buy the camera because it's adorable itself, let alone the water feature!! Wow! I want one too! We just went to the lake last week and I was so paranoid about my camera all day! good thing you have a water proof camera, but for those that don't and can't buy one(cough like me cough haha)... ziploc bags work perfectly..
thanks for doing the work for me. i was looking and got overwhelmed and quit. then i saw how good these were and the decision was made. No kidding. I was looking at waterproof cameras this morning. I want one. in May, for my kinder class' end of the year party - we were all at one of the kids' houses for a fun, little pool party. One of the moms had a waterproof digital camera and oh my - we got some fabulous shots with it. I was stunned...and now seeing yours...I'm sold. Okay, I'm sold. I want one NOW. I mean RIGHT NOW!! OMG! I just bought this same camera! I LOVE IT TO PIECES! Best invention ever! It takes awesome non-water photos also! ditto what Christina Thomas just posted. Just bought the same one for a reunion. It was so fun to be in the pool with the camera. But, oh, the anxiety of that first submerge!!! lol. It takes better pictures than my $250 camera...not my super good camera but better than my purse camera. LOVE it. Thanks for the tip!! !